Ayurvedic cream arshar forte is an ayurvedic formulation for hemorrhoids. This herbal remedy has astringent properties and hence tones the vascular musculature to improve the elasticity of the walls of the haemorrhoidal veins. This formula is used in the medical management of internal and external hemorrhoids and for preventing the recurrence of hemorrhoids following surgical removal with its anti-inflammatory, anti-bacterial, antiseptic and anti-haemorrhoidal properties, arshar forte is an ayurvedic hemorrhoid ointment that helps to shrink the pile mass, control bleeding and hasten the healing process in inflamed skin and mucous membranes. The local analgesic action of arshar forte relieves pain, and the soothing action facilitates the smooth evacuation of faces. Herbal remedies provide a safer alternative to treating arthritis than relying solely on prescription and over-the-counter drugs.Arthritis is one of the most debilitating and destructive chronic disorders. Since it affects so many of us, the shear number of different arthritis remedies on the market today can make choosing the right one for you overwhelming. Sricure's massage oil helps in removing pain by gently massaging twice a day.The remarkable Sricure's Massage oil has been formulated in order to provide relief from muscle strains and body aches. Oil is proven safe, time tested and highly efficacious remedy for people suffering from discomfort, acute and chronic pain, immobilizing stiffness of arthritis and joint pains. The herbs used in this formula have deep penetrating capacity soothing the nerves and cells resulting into fast action. Herbal Anti Inflammatory Cream is an ayurvedic massage cream made after extensive research by ayurvedic experts. Arthigo cream is made out of the finest herbs and has been very effective in all kinds of joint pains, sprains and swellings. Arthigos powerful herbal formula helps to alleviate pain and inflammation effectively and speedily. Indications: Joint pains Swellings and inflammations Rheumatoid arthritis Osteoarthritis Gout Sciatica Back pain Cervical spondylitis Frozen shoulder Packaging: Lamitube of 30 gm in a monocarton Application: Gently massage arthigo cream thrice daily. Avoid exposure to air or cold atmosphere for at least 2 hours after the application of the cream. Odor Kill Cream is an All-natural Herbal Formulation Which Contains No Aluminum or Alcohol. It Causes the Feet Feeling Soft, Dry and Odour-free. 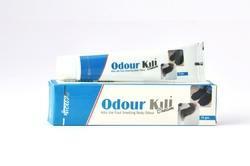 the Formulation Ensures That a Person Using Odour Kill Never Experiences Embarrassing Foot Odour. Odor Kill is to Be Used Once a Day After a Shower Bath, or Any Strenuous Activity. the Ingredients Are Gentle Yet Very Effective. Odor Kill Works by Killing the Bacteria and Fungus on the Skin. Scientific Studies Have Proven Anti-bacterial, Anti-fungal Odor Kill to Be 99% Effective. Odour Kill is Highly Effective Against Fungal Infections Which Are Primarily Caused by Sweat. Tinea Pedis is a Common Fungal Infection of the Skin Causing Itching and Scaling of the Infected Areas. Although the Condition Typically Affects the Feet, It Can Spread to Other Areas of the Body. Odour Kill Offers High Success Rate in Athlete's Foot Too. Application: Wash Your Feet in Warm Water. Apply Odour Kill Creamone May Need to Use It as Little as Once a Day. for Patients Who Sweat More, Apply Odour Kill 2-3 Times a Day.